The Honor 5X was launched in January, 2016. The phone comes with a 5.5 inch IPS LCD full HD display, with resolution of 1,080 x 1,920 pixels which results in a sharp pixel density of 401 ppi. It is powered by an octa core processor along with 2GB RAM and Adreno 405 graphics which ensures users get the best performance while gaming and running heavy apps. There in built storage is of 16GB that can be expanded up to 128GB via microSD card. As far as cameras are concerned, the 5X houses 13MP with features like LED flash, continuous shooting, HDR, touch to focus and GeoTagging. The rear camera shoots full HD videos at 30FPS. Up front, it has a 5MP shooter which is great for selfie lovers. The connectivity aspects on board include wifi 802.11 b/g/n, wifi direct, hotspot, v4.1, A2DP, microUSB v2.0, with A-GPS support and GLONASS. It packs a non-removable Li-Ion 3000 mah battery and runs Android 5.1.1(Lollipop). Sensors on the phone include compass magnetometer, proximity sensor, accelerometer and ambient light sensor. Huawei Honor 5X and OnePlus X are mid-range smartphones that compete against each other with price tags Rs 12,999 and Rs 14999 respectively. Huawei Honor 5x vs Lenovo Vibe S1: Which one offers more under your budget! Here we pit Huawei Honor 5X against Lenovo Vibe S1 to know which one stands taller than the other in the competition! 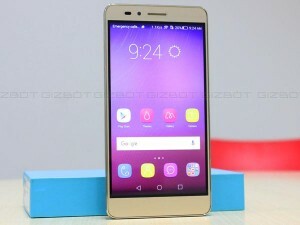 Read more..
Huawei Honor 5X vs Xiaomi Mi4i: Bigger and better budget warrior gets an edge! which is easy on your budget, and are confused between the Honor 5X and the Xiaomi Mi4i, here we give a specs comparison of both. Read More..
Huawei Honor 5X is a great mid-range phone with great camera features and skills. Here is why photography enthusiasts should consider buying it. Honor 5X, the no-nonsense smartphone with full metal body and finger print sensor is exclusively available at Flipkart and Amazon.